"I make this recipe as a side dish for homemade macaroni and cheese and Italian pasta dishes. The leftovers work great chopped up and thrown into spaghetti sauce!" 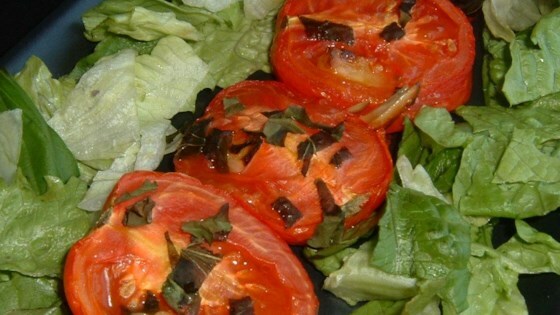 Place the tomato halves in a shallow baking dish in which they can all fit in snugly side by side. Insert the whole cloves of garlic in between the tomatoes. Brush olive oil over the top and sprinkle with basil. Season with salt and pepper. Bake uncovered for 35 to 45 minutes, until tomatoes have softened and are sizzling in the pan with the edges slightly charred. Serve while hot. See how to make quick-and-easy garlic bread with roasted garlic. it was alright... easy recipe to whip up but not fantastic. Yummy! Instead of whole garlic cloves inserted between the tomatoes, I simply used jarred fresh minced garlic spooned on top of the tomatoes. Great with grilled ribeyes. So tasty!!! I did add some grated parmesean cheese after I took them out of the oven. THEY ARE WONDERFUL thanks for a delicious recipe! !